(Lancaster, Pa., Jan. 10, 2017) - Former Lancaster Barnstormers outfielder Sean Halton has signed a minor league contract with the Detroit Tigers, it was announced today. Halton, 29, was inked by the Barnstormers during the pre-season in 2016 but headed to Reynosa in the Mexican League instead. With Reynosa, the Fresno, CA native batted .271 with two home runs and 17 RBI in 30 games. He joined the Barnstormers in mid-May and swung at a .290 clip for 106 games. Halton hammered 22 homers and 28 doubles in a Barnstormers uniform with 71 RBI. From June 21 through August 18, the right-handed slugger hit .335. He produced 48 extra base hits in 82 games from May 22 through August 18. During a four-game weekend series against the Sugar Land Skeeters in late May, Halton whacked four homers and drove in eight runs. 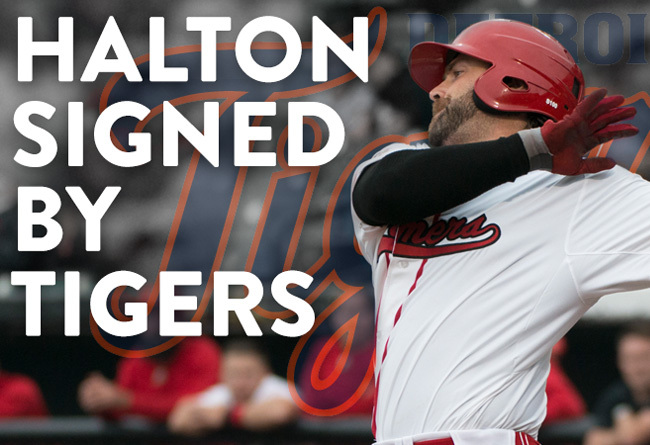 Halton spent the first six years of his professional career in the Milwaukee Brewers organization, batting .345 at the rookie level in 2009 and .298 with 39 doubles for Class AA Huntsville in 2011. He reached the big leagues in 2013, batting .238 with four homers in 42 games. One of those home runs was a walkoff shot off Cincinnati’s Zach Duke on September 15 of that year. He becomes the fourth member of the 2016 season-end Barnstormers club to join a Major League organization this winter, two shy of last off-season’s franchise record.